There was a fantastic turnout to last night's meeting. 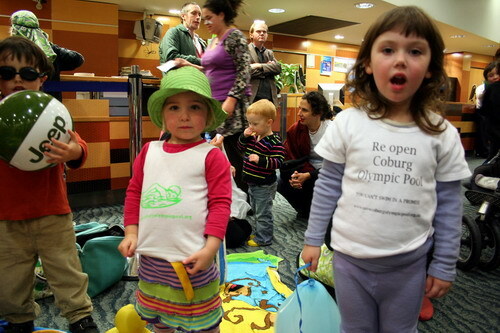 Colourful and cheerfully chaotic, with cake and lots of toys, the point was made that local residents are passionate about the Coburg Olympic Pool. That re-opening our pool by the Merri Creek is an issue that will not go away. About halfway through question time, Monique interupted me scribbling in my yellow book, "if you were a journalist, what do you think the main story would be tonight?" I looked at my list: the Fawkner Blues soccer club who are angry at the state of their grounds disprepair, the man that campaigns unendingly about the state of the public toilets in the area, another question about the closure of the Newlands Senior Citizen's centre, a shocking question about the state of the Pascoe Vale Pool last summer and of course, the fact that Coburg Olympic Pool has been closed for two summers in a row because it has not been properly maintained. "Infrastructure," I said. Monique nodded. "Anything that needs to be maintained." Yep. It's infrastructure alright. Public facilites that have been allowed to lapse into dangerous disrepair. It's like not maintaining a house properly and then having to spend huge amounts to repair damage caused by a a series of small problems like a small roof leak or slightly rusty guttering that's allowed to fester until it becomes a serious issue. Only on a much larger scale. With much bigger bucks needed to find solutions. At one point councillor Mark O'Brien stated that he supports council borrowing to fund the repair of crumbling infrastructure. More photos of the night here. At this stage, we still don't know whether there will be a funding allocation to fix our pool in this year's budget. The council is not giving any definite answers yet, it all depends on the budget, they say. The Moreland Council meeting where preliminary discussions regarding the budget for the coming financial year is being held this Wednesday night. This is when decisions about the future of our pool will be made. We can make a difference by attending. Venue: Coburg Council Chambers, Moreland Civic Centre, 90 Bell St Coburg. 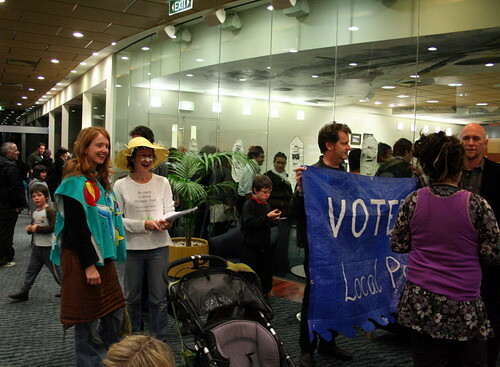 The plan is to get to the Council chambers at about 6.30pm and to congregate in the front of the council offices and in the foyer. Bring as many people as you can; including children (if that works for you) props like goggles, towels, bathers (if you can brave the cold), floaties, banners.